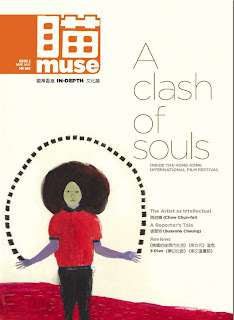 It was shear luck or fate that I got acquainted with the creative team of the MUSE magazine, a brand new cultural magazine in Hong Kong that is funded by Frank Proctor, now an admirable friend of mine. I got to know their sharp and non-compromising editor-in-chief Perry Lam last year when we started discussing the likely contents and direction of MUSE, then simply a brilliant idea on paper. Now after one and a half year's hard work, the magazine is alive and working with a belief that "Culture means more than just the arts. Culture is about how we live." I am proud to be associated with this magazine and am happy that Frank has allowed me time and again to input my spontaneous thoughts about the art and cultural scene of this dynamic city.